Tiger Muay Thai and MMA training camp, Phuket, Thailand fighter is on a fight and seminar tour of London and Europe. 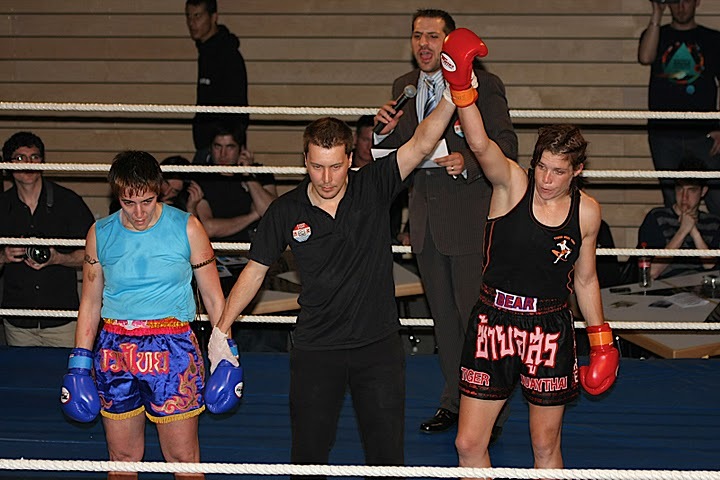 Claire easily won her first fight at the Kampf Sport Federation Gala on April 17, 2010 using her speed and technique. Claire and Tiger Muay thai and MMA trainer then went to Diesel Gym for a seminar by Goi (3 X Lumpinee Champion) and Claire to prepare for her next fight. Then on April 25, Claire went to a draw with Amanda Kelly of the London K.O. Gym. The main event for Claire will be the rematch against #1 World ranked Muay Thai fighter Julie Kitchen as they fight for the IKF 62 KG World Title in Cornwall on May 9, 2010.